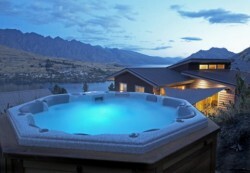 Welcome to our selection of holiday homes to rent in New Zealand. New Zealand is an island country in the South Pacific situated 900 miles east of Australia. It is split into two main landmasses called the North Island and the South Island with a few smaller islets sprinkled around; encompassing a total area of around 100,000 square miles. The climate is described as mild to moderate - significantly cooler than most of the South Pacific. The land is largely mountainous, and is also featured with forests, fiords and active volcanoes. The weather system can vary greatly according to altitude. It is one of the most recent lands on Earth to be settled upon by humans, before which the land had been geographically isolated for around 80 million years. This isolation meant a unique flora and fauna structure until human intervention caused some natural imbalance. The main appeal New Zealand offers for visitors is its large expanses of unspoilt natural beauty. The coast can guarantee views of penguin and seal colonies while, further out to sea; whale watching by boat is a popular distraction. Dolphins may be observed at even more close quarters courtesy of dolphin-related swimming tours. An even easier means of viewing marine life is by visiting the many aquariums scattered around. The wildlife inland is an interesting mix of native and introduced species. Originally New Zealand had no native mammals other than bats. The more remarkable species would include; The Giant Weta, resembling a huge grasshopper, which is the world's heaviest insect, the Tuatara, a lizard of a variety which is extinct everywhere else in the world and the Kiwi, a flightless bird resembling no other bird on Earth and national symbol of New Zealand. Looking for self catering holiday accommodation in New Zealand? then below is a selection of villas in New Zealand and apartments in New Zealand that can be rented direct from their owners. You can either click on each listing for further details or you can use our search engine on the left if you are looking for something in particular. Here you can find useful links for tourist attractions and services in New Zealand including links to Tongariro National Park, the Franz Josef Glacier and more.